Last week's DICE summit kicked off with a game of golf in the Nevada desert. To keep things interesting, and raise a bit of cash for charity, Electronic Arts added microtransactions to the game. We heard about the event through some of the coverage last week. 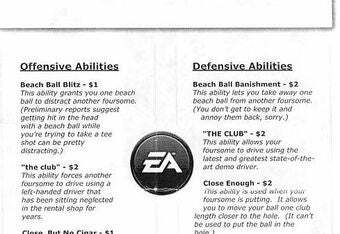 It involved golfers buying power-ups that could move golf balls, allow you to kick a ball into the water or arm golfers with beach balls. Hit up MTV's Multiplayer for the full menu of options. They should look at adding this to the PGA.